Our factory-trained technicians are skilled in Cat-3, Cat-5, and Cat-6 non-plenum and plenum cable installations. We offer voice and data cabling design and implementation from small (1-5 cables for small business/office moves) to large (several hundred cables) in scope. Any and all of our technicians are thoroughly trained to do cable installations and troubleshooting. Beyond our regular office hours, we have a technical support staff available seven days a week, 24 hours a day. We take great pride in the levels of service that we offer to our customer base, including hundreds of state agencies. We have completed large cable installations within restricted time frames for many of our valued customers. We are a Hubbell Premise Wiring Mission Critical certified dealer. We provide a full line of the highest quality cabling products, so you can be assured that a Preferred installation will include superior products that will last. We offer free quotes for all cabling services – please let us meet with you before your building plans are completed so that we can help you to make sure that all of your needs will be met. 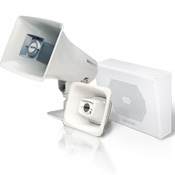 We offer both Valcom and Toa paging equipment. 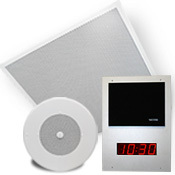 We install ceiling speakers, horns, wall baffle, waterproof outdoor speakers, and both one-way and talkback applications. We also provide and install door phone and door intercom units.